Posted in Advertising & Social Media	by M.L. If you are in advertising and marketing, then you know that Facebook is constantly making changes to its site, pages and policies, and the company is not always perfectly transparent about these changes. You also know that within the past month star ratings on a scale of one to five have begun to appear prominently on business pages, right under the name of the business. Individual reviews and ratings also appear on the page, in the right-hand column for desktop and above page posts on the mobile app. When these ratings first appeared, I saw several articles and blog posts talking about how these ratings could be good or bad. HubSpot argued both ways in an attempt to remain neutral, as did TechCrunch, while InvestmentNews tells advertisers they should be concerned. 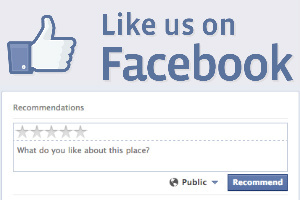 Business Insider says that the ratings will put Facebook in direct competition with Yelp and FourSquare. Other sources, like Social Media Today raised the questions we should all be asking.